Alluna Newton Astrographs are uncompromising on highest optical and mechanical quality designed High-End Telescopes. As a pure Astrograph or as a robust Observatory Telescope for visual use or for research, the Alluna Newton Astrographs feel at home in many areas. In optics, the core of each optical Telescope, we make no compromises, only high-quality optics from our own production. 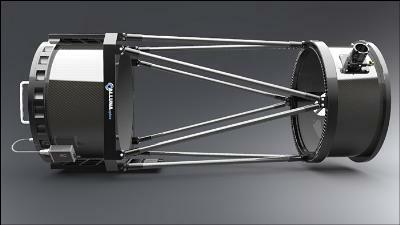 The tube is, as in our RC-Telescopes, made of a honeycomb-pocket structure. A Newton system can visually and photographically deliver high-contrast images. To be the main mirror has a precise parabolic shape and a low surface roughness. We guarantee that these conditions are met in every Newton optic. Alluna Newton Astrographs are in four sizes 16, 18, 20 and 24 inches available in standard with aperture f4 system. We can offer openings down to f 3.4 to f4,2. With the 3 Inch Wynne Corrector one photographic coma free field to 45 mm. All Carbon Aluminium Truss tube major parts are milled from solid aluminum and through a honeycomb-pocket structure, have enormous stability and stiffness. For construction and design of the systems we use the indispensable support of modern CAD. Complex Parts and assemblies are modeled exactly as required and run-assembled virtually. Thus, all Parts by weight, stability and expansion properties are optimized. The extensive FEA (finite element analysis) also helps the process of analyzing all important parts of stress simulation. - Absolutely high-quality optics, mechanics and software complete fabrication "Made in Germany " ! Click the button below to add the Alluna Optics Alluna NA-24 24" f/4 Newtonian Astrograph Telescope to your wish list.